The LESHP Game and Trail Scouting Deer Camera Digital Surveillance are known for its exceptional reliability and excellent performance. The 12-megapixel resolution can provide brightly-colored and lively pictures of the wild during the daytime. During nighttime, you can capture clear monochrome photos. It also features useful technology to make your experience more fun and even better. The game camera, just like any other game camera should be, features the no glow infrared technology that helps you to capture high-quality images during the night. With its camouflage exterior combined with the black LED, rest assured that the wild animals will barely notice the existence of the camera hanging in the tree or hidden in the bush. Aside from that, the long trigger distance and super fast trigger speed make the camera a lot reliable in the forest. The 0.4-second trigger speed will grab all great opportunities for capturing rare photos in the wild. The black built-in 42 pcs Ir LED screen also provides 66 ft of nighttime vision, making sure that you can capture moving objects even in a wider range of distance, making the camera ideal for stalking your target prey. If you are keen on the durability, the game camera can withstand harsh elements of nature for a couple of weeks in the forest with the super IP66 waterproof and dust-proof design 2.4” LCD screen. You can also choose among three video modes the game camera offers for a better modification and greater shootings of the wild. Just make sure that you read the user manual carefully before you start on modifying settings to avoid rookie mistakes. The battery can last for up to 6 months, so you only need to go back into the field to retrieve your SD card and see what you had captured so far. The 8 AA batteries (which is not included) provides a longer battery life for your game camera. It also features the password protection. You can input your passcode so that the access is limited to those who only knew about your passcode. You can also use this game camera as your personal security system because it’s effortless to install. Not to mention that the game camera itself is user-friendly, so you won’t have a hard time in navigating and utilizing the game camera. Should you have any inquiries or you need further assistance in using the camera, rest assured that the professional after-sales support of the LESHP service can help you with your needs. Just give them a call, and you will be instructed on what to do with your game camera. The game camera is specifically designed to detect any sudden movements within the range of its coverage. Therefore, you can rest assured that you will be able to capture the deer roaming around at night for food or even the silent battle between the snake and a rat. It’s a great way to explore the forest without risking yourself thoroughly. Since you can preview the images of what you’ve captured on the LED screen, you can avoid hassles and the like. You don’t need to connect the game camera to your computer before you can review what you’ve already had after a few weeks of the game camera in the forest. The game camera sends an alarm when it reaches the low battery. And this alarm can sometimes draw attention for thieves in the woods or even startle the animal. Therefore, you need to check every time you retrieve the SD card if your game camera needs a battery replacement or not. Some customers had claimed that even though the camera utilizes advanced technology and promotes high-quality resolution, you will only be able to use the full HD unless you are going to shoot a possum. There are times when the camera fails to recognize wild animals, limiting your chances or retrieving high-quality photos so you may have to wait some more time before you recover the SD cards for results. 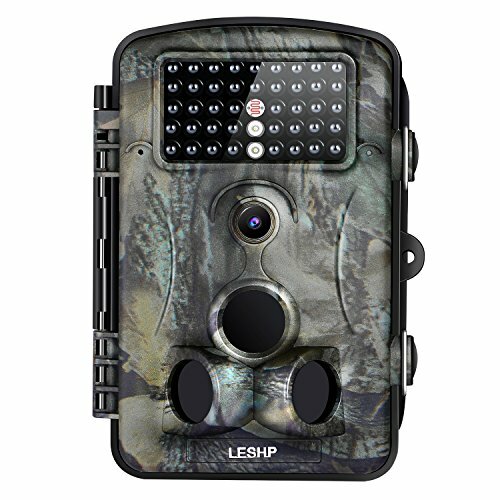 The LESHP released a game camera ideal for any surveillance or scouting game. The game camera is far from most of the best-selling cameras the company owned because of its high-quality performance and advanced technology. If you are living in a country with extreme sunlight during summer and crazy snowstorms during the winter, this could be the one that you are looking for as it can withstand heavy rain and intense sunlight. No matter how bad the weather could be, you will still be rewarded with high-quality pictures of the wild. Regardless if you are still new to hunting or not, this game camera will suit all your needs.